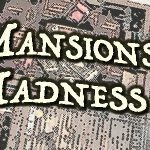 Mansions of Madness 2 – First Look! I bought a copy of Mansions of Madness 2 after playing it at MACE in late Fall of 2017. 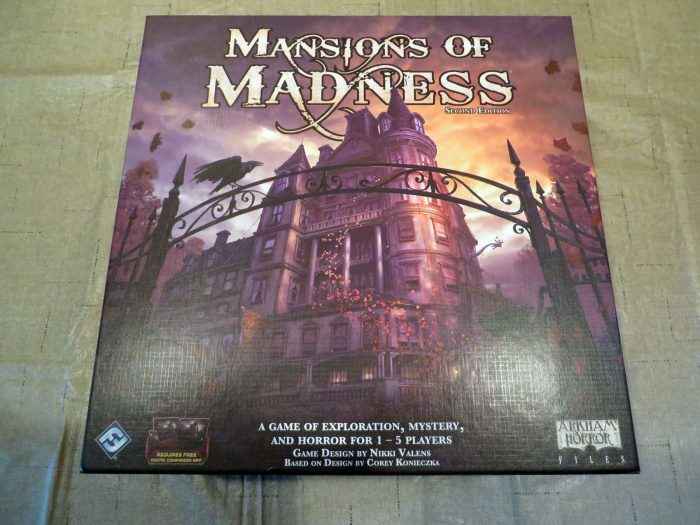 Mansions of Madness 2 is a cooperative horror, puzzle, exploration and combat game from Fantasy Flight Games. 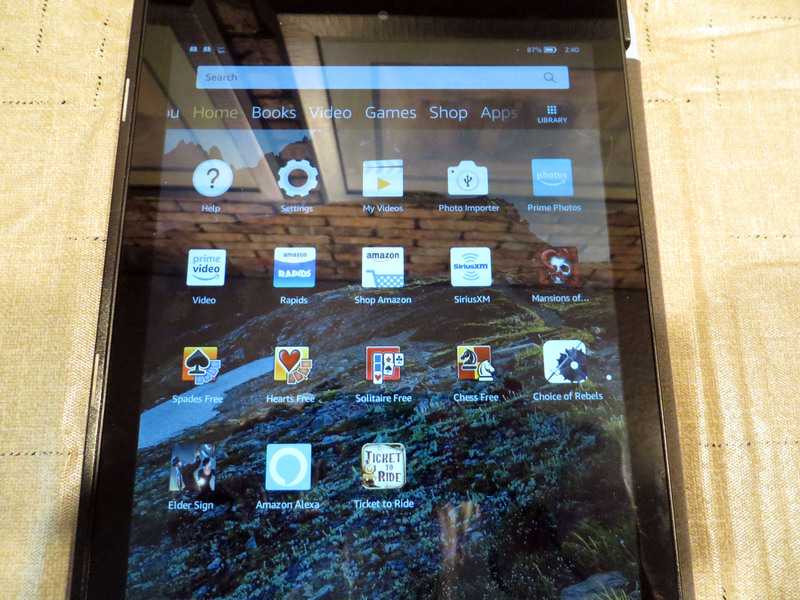 A groundbreaking aspect of the game is that a computer app (which can be run on a smart phone or a tablet) is an essential game component. The game board consists of 24 map tiles. When the players start the game they are in an entrance hall with a number of closed doors. 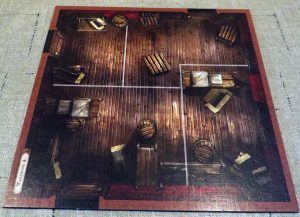 The actual layout of the house is unknown to the players. Only as they open doors or find secret passages are more rooms revealed. The map tiles can be configured in many ways ensuring the playfield will not be known to the players. Although the room tiles have marked doors, the game app determines the location of potential clues and specific door locations. This means some doors may be replaced with wall markers. An otherwise blank wall might contain a secret door. 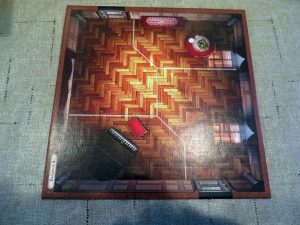 The rooms tiles are lavishly illustrated on very heavy cardboard and resemble rooms from the 1920s. I’ve taken closeups of the ballroom tile and a warehouse tile to illustrate. A variety of monsters may be encountered by players ranging from human cultists to horrifying Lovecraftian Mythos Monsters such as hunting horrors, deep ones, and star spawn of Cthulhu. Monsters are illustrated in two ways. Each monster has an individual cardboard counter containing vital statistics and a brief description. 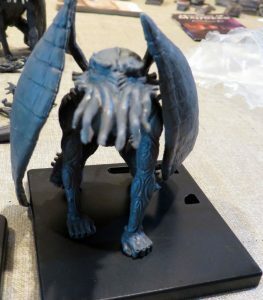 A plastic figure is available for each monster. The cardboard monster counter can be inserted into the base of the monster figure. The unpainted figures are well done. The monster tokens effectively convey important information and are drawn in a “lifelike” disturbing fashion. 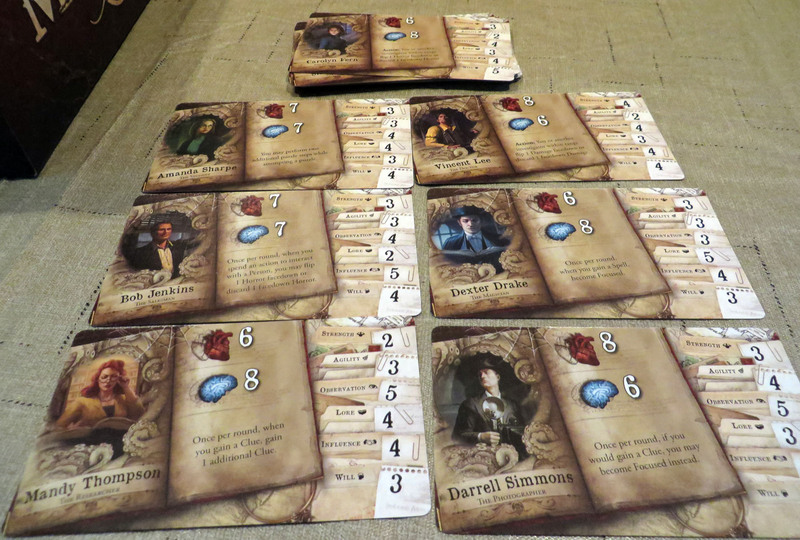 The base game has eight investigators. 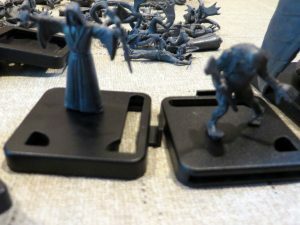 Each has an associated Investigator Card and a matching figure. There game has 5, eight-sided dice. 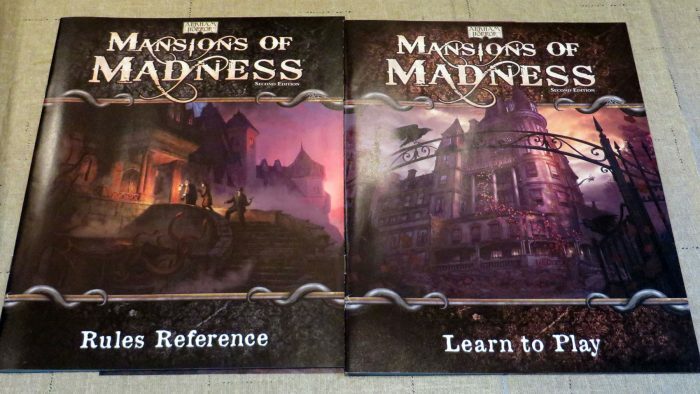 Additionally, the game includes investigator cards, monster figures and monster tokens for the 1stEdition of Mansions of Madness and its associated expansions. I cannot verify if the materials for the inclusion of the first edition scenarios is exhaustive. Players choose one avatar with an associated investigator card and figure. 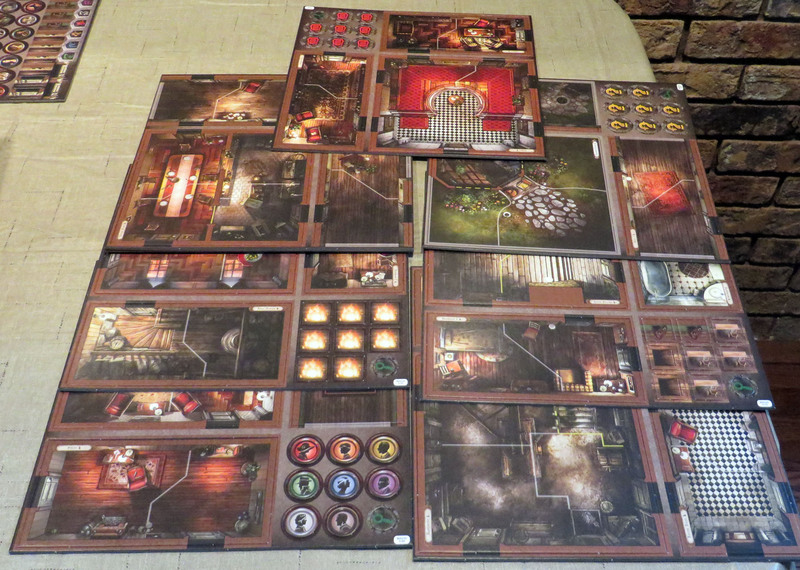 Your investigator figure moves through the mansion investigating clues, opening doors and fighting horrors (both physicial monsters and psychological horrors). The dice are sturdy. The eight sides of the die contain three elder signs (representing a success on the roll); two clues (representing a fail that can be pushed into a success) and three blank sides (representing a hard fail). 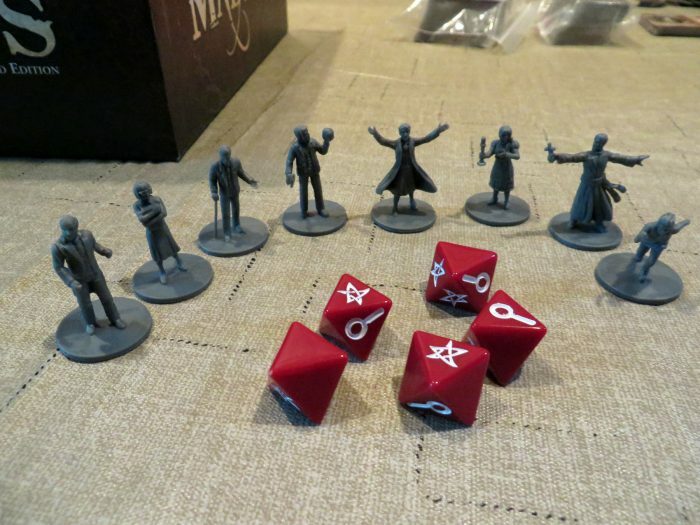 Clue tokens can be used to push a “clue result” on a dice roll from a conditional failure into a success. Players may acquire items allowing failed dice to be rerolled or which change a clue result into a success. Players start with a handful of clues. Additional clues are obtained by solving puzzles, passing tests, or searching objects identified by the app. A pocketful of clues changes many test failures into successes. Without clues passing tests, evading attacks, landing blows on monsters, and casting spells much harder. Each investigator has six characteristics representing different skills. No character is good at everything and the overall group needs a mix of character skills to succeed. Selecting all combat characters (strength and agility) but weak in investigation, lore and persuasion is a recipe for disaster. Likewise, characters with great soft skills and weak combat skills will give the physical opponents a tasty meal. The final items are cards. 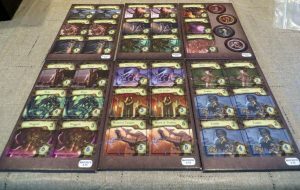 There are 40 common item cards representing everything from weapons to light sources to common religious items. There are 24 unique item cards which may be necessary to open specific doors or solve specific puzzles. There are 30 spell cards with multiple cards for each spell. A dice roll test must be passed to cast a spell as indicated by the computer app. If cast successfully, the spell card is flipped over and other things (good, bad, or both) happen. Then the spell card is discarded and a different card with the same spell (but with an unknown effect upon a successful casting) is randomly selected. There are 40 damage cards for physical damage and 40 horror cards for psychological damage. There are 37 condition cards for positive (focused, enraged) or negative (stunned, dazed, confused, or restrained) conditions.